UV Water Filters works by collecting the ponds algae passing it through an UV Light and the bio balls collect the "after" debris and leaves clean water returning to your pond or watergarden. This is constantly done with the use of coutinuous flowing water. You don't really need one but your pond sure does! So does the fish in your pond as the algae robs the oxygen from the water which will eventually kill your fish leaving your pond with that ugly green gunk "pea soup" look that is not appealing. You want a clean fresh running waterfall, fountain and pond? Then you need the UV Clarifier! Keep your watergarden and pond free from algae, green slime and having the "pea soup" look. 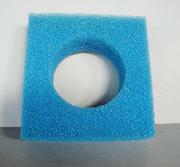 Below are replacement parts for your United Aqua Shield UV Filter. 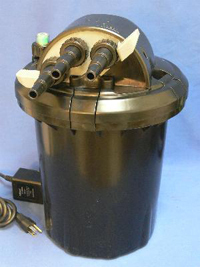 Parts are limited as the filter is no longer manufactured. We keep an updated inventory on how many we have in stock. We strongly suggest, if you need any of these parts to get them while we have them in stock. It's a lot less expensive than a new unit.